Pulut Tekan is just a plain glutinous rice cake. It is served with kaya(jam from pandan leaves) coconut jam. 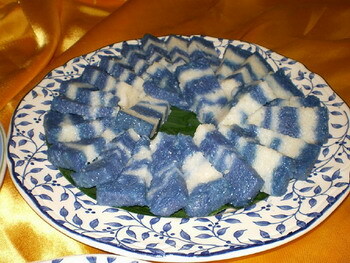 The glutinous rice cakes are coloured with bunga telang. Half-cooked glutinous rice is divided into two portions. Both are them added with coconut milk but one of them is added with the bunga telang juice. This gives the rice cake a very bright blueish-indigo colour which is appealing to children. The half-cooked glutinous rice is then scooped in alternating fashion into the original tray to give it a marble effect of blue and white. The rice is then cooked some more and when it is cooked and cooled, it is cut into tall rectangulars. This is a typical Nyonya delicacy. There are many kinds of changs sold in Kuching. Changs are savoury dumplings that are usually filled with meat, red bean and peanuts paste. They are either made from balls of dough or are small parcels of food encased in leaves. After being encased in leaves, they usually undergo a further treatment by steaming them or submerging them in boiling oil. 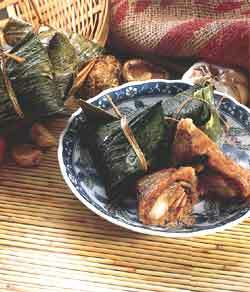 Bak Chang, or meat dumplings, usually have pork belly, Chinese Mushrooms, dried shrimps and chestnuts as its fillings. Kuih Lapis (layer cake) is a rich kuih consisting of thin alternating layers made of butter, eggs and sugar, piled on top of each other. Each layer is laid down and baked or steamed separately, making the creation of a kuih lapis an extremely laborious and time-consuming process. However, it will cost you only 30-40 cent per piece of delicious kueh lapis.